Functional foods and nutraceuticals have received considerable interest in the past decade largely due to increasing consumer awareness of the health benefits associated with food. Diet in human health is no longer a matter of simple nutrition: consumers are more proactive and increasingly interested in the health benefits of functional foods and their role in the prevention of illness and chronic conditions. This, combined with an aging population that focuses not only on longevity but also quality of life, has created a market for functional foods and nutraceuticals. 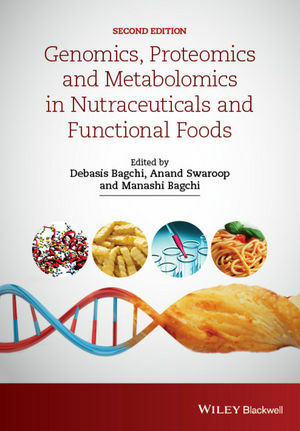 A fully updated and revised second edition, Genomics, Proteomics and Metabolomics in Nutraceuticals and Functional Foods reflects the recent upsurge in "omics" technologies and features 48 chapters that cover topics including genomics, proteomics, metabolomics, epigenetics, peptidomics, nutrigenomics and human health, transcriptomics, nutriethics and nanotechnology. This cutting-edge volume, written by a panel of experts from around the globe reviews the latest developments in the field with an emphasis on the application of these novel technologies to functional foods and nutraceuticals.